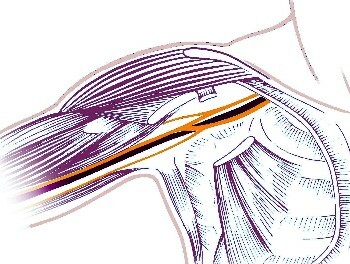 What type of anesthesia is typically selected for surgery on flexor tendon injuries? How is the anesthesia performed? When is a patient allowed food/drink after this form of anesthesia? In addition to general anesthesia there are several options to numb “just” the hand or arm that requires surgery (regional anesthesia). The most common form of regional anesthesia for procedures on hands/arms is the brachial plexus anesthesia (often referred to as plexus block). This type of regional anesthesia is particularly helpful in cases where surgery becomes so critical, that even the fact that a patient had food or drink right before surgery does not allow for postponement of the intervention. The patient´s risk of choking due to vomit getting into the trachea is much smaller, since defense mechanisms such as coughing or swallowing remain completely intact while under plexus block. In case of the (most commonly applied) plexus block, the nerve network in the area of the armpit gets numbed. The image to the left shows an actual performance of a brachial plexus block. 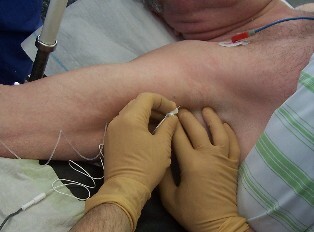 Seen here is a simplified display (image to the left) of the nerve network in the armpit receiving anesthesia. It is crucial that the anesthesia guarantees painlessness in the entire arm. The intervention also requires the deactivation of the blood supply to the hand for the entire duration of the procedure. Only a bloodless operating surface will secure a precise fitting of the flexor tendon sutures while also enabling the surgeon to identify collateral injuries to the blood vessels or nerves and take care of them. Once surgery has been completed the patient usually is allowed food and drink shortly thereafter and is also permitted to get out of bed. From a medical point of view a great advantage of this form of anesthesia is that it holds up for several hours after the procedure took place. This allows for pain management, meaning the patient remains painless for several hours without the need of further pain killers. In addition, Plexus block improves the blood circulation within the hand. This is of particular importance when arteries require surgery along with the flexor tendons.